Let me organise an Obligation Free Consultation for you with one of our Ventilation Specialists. A damp home may not seem like a big deal but in reality, it can cause long-term damage, not only to the structure of the home but also to your health. Dampness affects the quality of air that you breathe in while you’re indoors. In fact, a damp home actually has air that contains pollutants which can trigger the development of asthma and other respiratory-related infections. It can also trigger allergic reactions. These are the reasons that motivate Mouldbuster to provide viable products that facilitate the treatment of rising damp in your home. One of the main problems that come about when homes or other buildings are damp is the development of mould. As a result, other allergens are produced. Even if your house is clean and dust-free, you may find yourself sneezing, experiencing itchy eyes or a runny nose when you come in contact with the spores produced when mould grows. Another danger associated with rising damp is the fact that it creates a suitable environment for the development and multiplication of harmful bacteria. Even mice and roaches will find a good habitat. Whenever there is too much moisture in the air, it condenses back into water droplets when it touches any cold surface in the house. The wall or window may provide this cold surface. As a result, the condensed moisture, which is now in the form of water droplets, will cause rising damp. Another place that causes rising damp within the house is the sub floor. The sub floor, also known as the under floor, can easily harbor too much moisture, especially when there isn’t sufficient ventilation to facilitate the circulation of air. 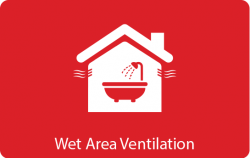 A leaking pipe beneath your floor can also cause the sub floor to become damp, more so when there aren’t enough vents or a ventilation system that can facilitate proper circulation of air. This damp air in the sub floor can cause damage to the timber and create an environment in which termites could easily attack the home. Additionally, metallic material will experience corrosion, causing damage to the entire building. Rising damp is a real risk to your home, but sub-floor ventilation can easily eradicate this problem or prevent rising damp from developing. In order to identify and treat rising damp, you need to be aware of the exact problem and then look for possible solutions. Our team of experts will help in identifying the cause of rising damp. We will inspect your home and the common areas where damp, rising damp to be precise, originates. The sub-floor is one of them, as we have discussed, and we will check for damage to the water pipes or any issues related to ventilation. We will thus do our part in ensuring your home is damp-proof. If you are considering complete ventilation of your house, then you should be aware that they use mechanical systems and are insulated in order to achieve energy efficiency. Some of the common types of systems in this category include the supply, energy recovery, balanced, and exhaust systems. The supply ventilation system is mainly composed of a fan that creates positive pressure by blowing in fresh and dry air from outside. This influx of fresh air will automatically push out the stale air from the home. The movement will be facilitated by the positive pressure created by the air from outside. The energy recovery system creates proper ventilation for the home as it minimizes the loss of energy. This is accomplished by warming the fresh air from the outside through the heat extracted from the stale air that is expelled. The balanced ventilation system, as the name suggests, has a balanced flow of air in that one fan creates positive pressure while the other creates negative pressure. An equal amount of fresh air is brought in to replace the stale air that is expelled. In the exhaust system, a fan that creates negative pressure is used to extract damp air from the house. The space that is left unoccupied is then filled up with dry and fresh air from the outside. When it comes to sub floor ventilation systems, there are three types that work well – the balanced, exhaust or supply systems. We can either install a ventilation system for the whole house or just for the under floor area. These systems will stop rising damp! Our Mouldbuster team in Australia has the skills and experience required to deliver a great job and guarantee that your house will be damp-proof! 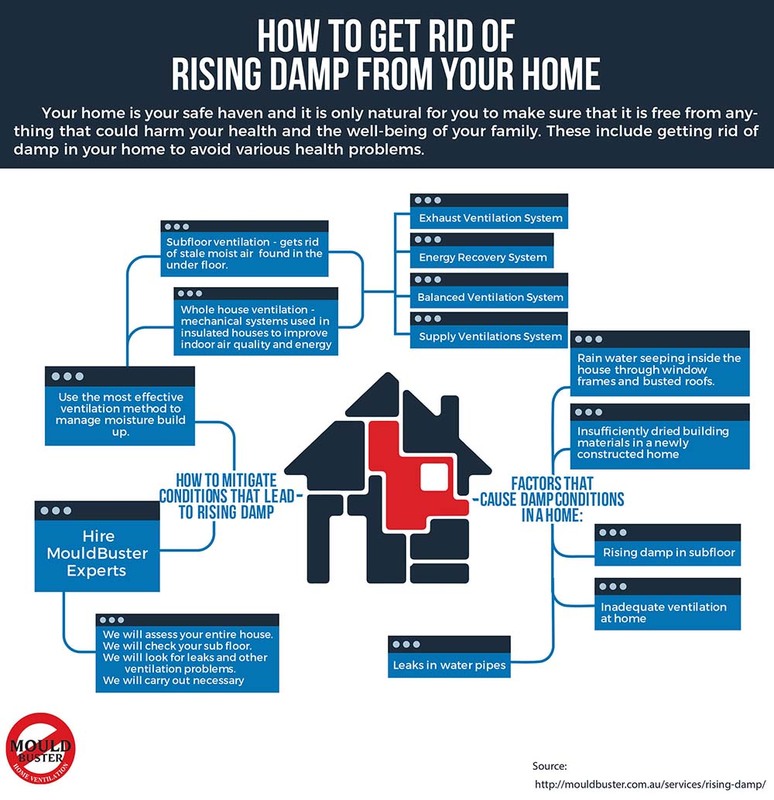 You can call us on 1300 066 853 and get advice on the best option and services required to treat rising damp in your home. © Copyright 2016 Mouldbuster. All Rights Reserved.